Meet Kenny Jacobson, an integral part of the team in ZBAG’s shop who specializes in dismantling transfer cases, although Kenny does take apart other drivetrain component as needed. Kenny comes from a background that includes plenty of automotive experiences. 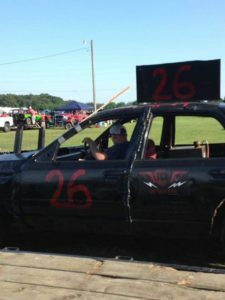 He formerly ran his own car detailing business, and is a long-time demolition derby driver. He generally goes to two area derbies each year. “I use the same car at both places if I can get it bent back straight,” he explained. When asked what he looks for in a good derby car, he said, “I don’t know. I never found one.” He thinks a Chevy Impala from around 1975 would be an ideal derby car because they were built stronger back then. In Kenny’s opinion though, the worst derby car he’s had was a Crown Vic. “I got stuck on the wall twice with it,” he recalled. When he’s not working on a derby vehicle, Kenny enjoys doing some four-wheeling on his family’s property, and he enjoys hunting and fishing when he has the chance.